What to do with empty storefronts that is the question.The Village of Nyack came up with a an interesting answer to this age old question. With the help of sponsors and some willing landlords, the village transformed those empty business storefronts on Main Street and Broadway into an outdoor art installation. Mayor Jen White worked with local businesses to sponsor the artists and the landlords lent their space for a unique opportunity to market vacant properties while spreading some holiday cheer during December and January. The Athene Insurance building on North Broadway, at the corner of Main Street, will showcase four artists. Riverwaves Salon on Broadway and 86 Main St. will also spotlight work from local artists working in diverse media. Nyack native Tony Oursler, whose work has appeared in the Whitney Museum of American Art and MOMA, is contributing original work, along with Michael Zansky, whose installations have been exhibited at the Brooklyn Museum of Art and the Los Angeles County Museum. The artists, including Kris Burns, Suzanna Frosch, Jane Cowles, Matthew Hames Smith and Jamie Gaviola are all from Rockland County and were given the freedom to come up with their own design. Each window is sponsored by a local business and each artist had until Friday afternoon to complete their work before the official unveiling at 6:30 p.m. Several works were covered in brown paper Friday, preventing any sneak peeks. 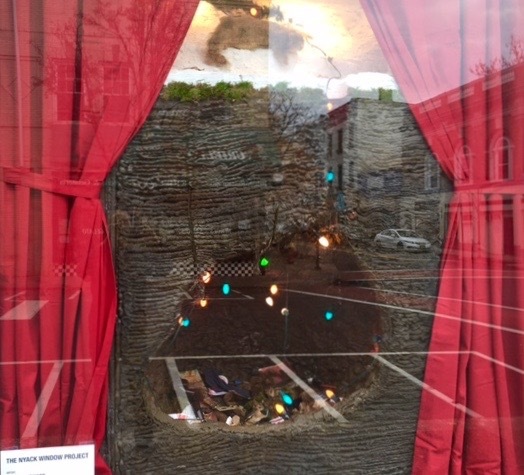 I was honored along with Wright Bros. Real Estate to sponsor Joanne Howards’s installation at the Athene building.